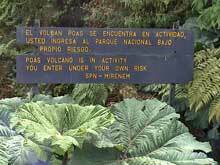 A sign warns visitors that the volcano is active. Due to increased and unpredictable volcanic activiy then national park remains closed for visitors since April 2017! The Poas Volcano National Park is the most visited national park of Costa Rica. It is a popular travel destination for day trips from San Jose. The road to the volcano curls uphill through coffee plantations, passing rustic restaurants. You can reach the Poas Volcano with public transportation from San Jose or Alajuela. The park measures 5600 hectares and is one of the best equipped. The 300 m long trail to the crater is paved, it is wheelchair accessible. From the lookout point, located at the edge of the crater in an altitude of 2700 meters, it is possible to see the crater and a great perspective of the landscape. The crater is 320 meters deep and 1.5 kilometers wide. It is one of the biggest craters in the world and the biggest of Costa Rica. The turquoise crater lake of the Poas Volcano. The magnificent turquoise sulphur lake can be seen on the bottom of the crater. There is a great amount of fumaroles that indicate the permanent activity of the volcano. Later in he day the visibility is often hindered by clouds, it is the best to visit the Poas Volcano National Park in the morning. Another trail leads to the extinct Botos Crater. Hummingbirds and the Clay-colored Robin can be spotted in this area, 79 bird species have been identified here. The Clay-colored Robin is the national bird of Costa Rica. 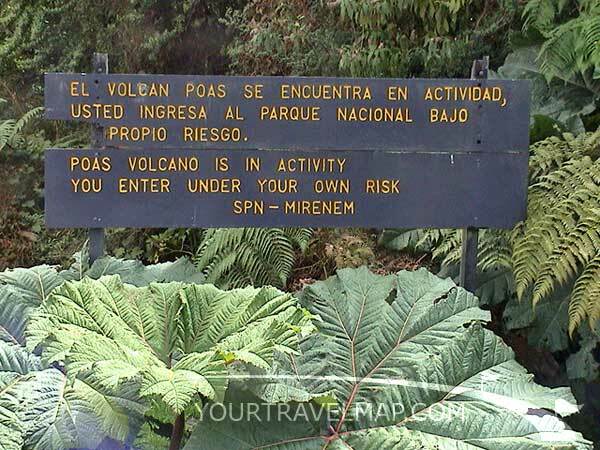 The Poas Volcano National Park was created on January 25th 1971. The Poas Volcano National Park ist the most visited national park of Costa Rica. 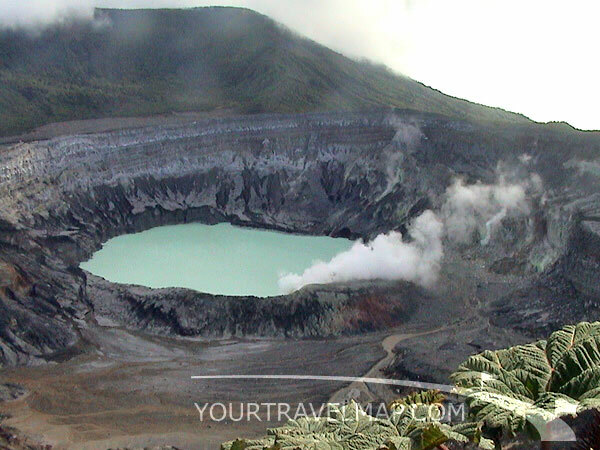 The crater of the Poas volcano has a diameter of 1.5 kilometers and is the widest crater in Costa Rica. The path to the crater is accessible with a wheelchair. The average temperature is 16°Celsius (60.8°Fahrenheit). The annual precipitation is 3500 mm. Business hours: The park is open every day from 8:00 am to 3:30 pm. A visitor center and a cafeteria with a souvenir shop are located near the parking lot. The last big eruptions of the Poas Volcano have been in the years 1910 and 1974. In the years 1989, 1994 and 2007 the park was temporarily closed because of activities of the volcano and acid sulphur fumes. From January 8. till January 20. 2009 the park was closed for visitors. On the 8. of January a 6.2 magnitude earthquake had hit the area of the Poas Volcano.